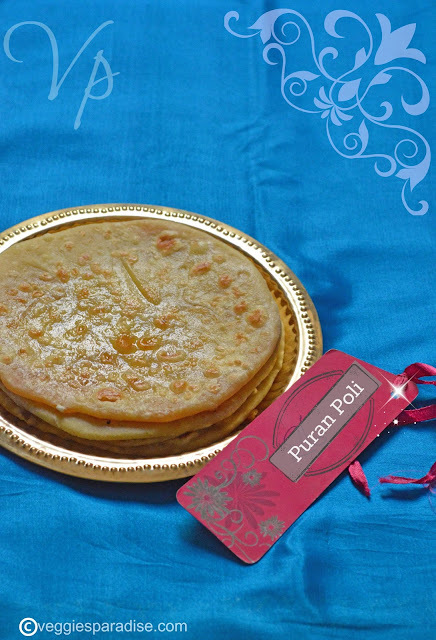 Puran Poli - A traditional and delicious sweet prepared during festive occasions.It is also known as Bobbattu or Holige or Obbattu . Poli is nothing but a sweetened flatbread . 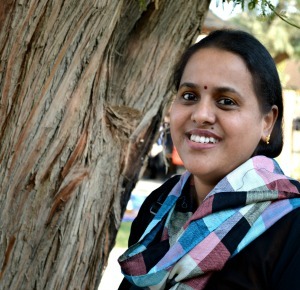 The main ingredient for this recipe is maida , chana dal and jaggery. A sweet filling is prepared with chana dal and jaggery . Now this filling or puran is stuffed inside a maida based dough and flattened. The flattened bread is placed in a hot tawa smeared with oil or ghee and cooked until both sides turn golden brown. Now let us start with the preparation. 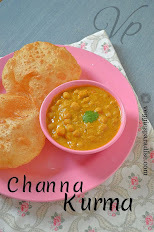 Wash the chana dal , pressure cook and drain all the excess water. Meanwhile in a bowl, make a dough with maida, turmeric powder, salt by adding water little by little.Add ghee and knead it well until soft. Cover with a damp cloth and set aside for half an hour . In a heavy bottomed plan,add the jaggery,cooked chana dal and grated coconut .Mix well and cook on medium flame until the mixture dries or thickens.Finally tip in the cardamom powder. Stir it gently and remove from heat. Divide the dough and the stuffing to equal portions and roll into balls. Take a ball and flatten it, place the stuffing in the middle, cover and seal the edges. Dust it with flour and roll it out into a flat bread . Heat a tawa and cook the poli until both sides turn light golden brown . Delicious puran poli is ready to be served. Drizzle with little ghee on top and serve it. Puran poli looks divine..my favourite. 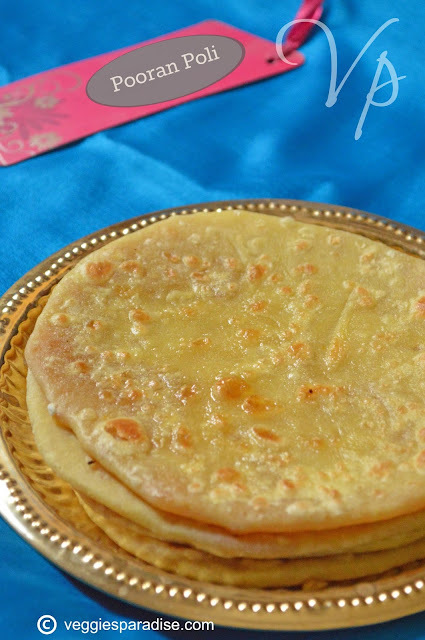 Tempting puran poli, one of my fav dish. yummy .. so flavorful...already drooling! perfectly made poli.. looks great!! Awesome and lovely looking polis. Poli looks very perfect and delicious.